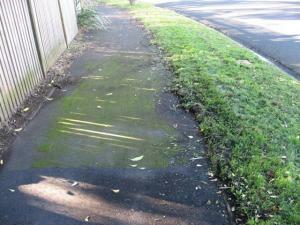 Moss and growth still on footpath, now with sediment from the waterblasting. Sent to Auckland Transport 6 min later. job was previously reported. then promptly waterblasted in front of number 18, but there is a clear strip of moss from number 20 onwards. growth also not cleared. and now there is sediment from the waterblasting covering the footpath and a manhole. trees also not cleared. all of this is next to an electricity substation. please do the job properly this time. The remaining moss has now been waterblasted and the sediment cleaned away (a few days after original post) Apparently the overhanging trees have been reported to council. All in all, the response was prompt and good but would have been better if they had fixed it the first time. They have said they will also clean up Tuakana and Taratoa footpaths - I will keep on eye on this to see if it is completed.